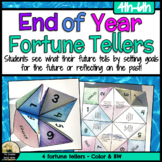 This file contains the fortune teller game template, as well as fun ways to incorporate this game into a classroom or home activity. 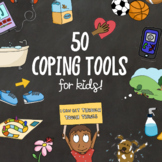 Construction time varies upon age of child (5-15 minutes) and can be used for hours of fun! 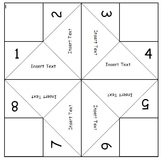 Use this "Fortune Teller" template to add your own prompts that you want students to use. 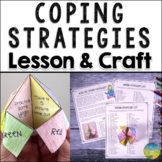 Can be used for: •concept review •drawing prompts •vocabulary review •and so much more! 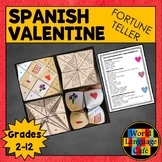 This FREE product contains two editable origami fortune teller templates that are referred to in the Math TicTacToe Choice Boards in my store. 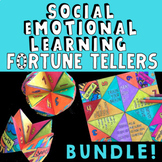 These fortune tellers can be used for any content area or just for fun! 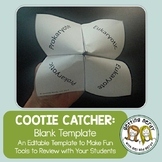 Students love making them and quizzing their friends. This template can be used for anything! For example, a review or a game. 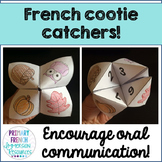 French cootie catchers / fortune tellers! 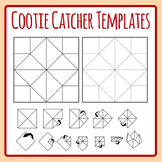 Have your students practices their vocabulary using this great fortune teller / cootie catcher template. 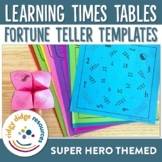 It makes learning vocabulary so much fun! 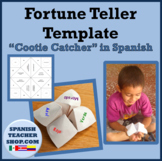 This EDITABLE TEMPLATE is a new and fun way for your students to learn their vocabulary words. 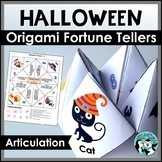 This origami game holds 12 words and 8 definitions. I use it for science, but it is easily adaptable for nearly any subject from 2nd through 12th grade.